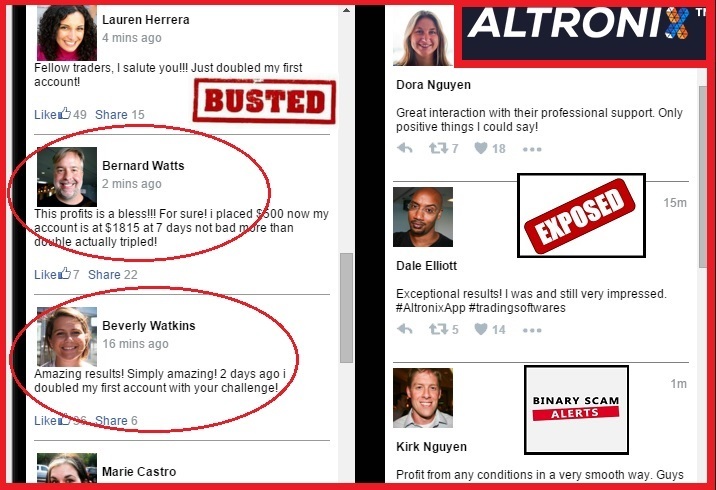 If you have searched the internet looking for an honest review about the Altronix App (AKA Altronix Software and Auto-Trader) and Frank Saunders, you should not be surprised to find out that it is a malicious, misleading, and deceptive binary options SCAM. Our team of persistent researchers conducted an in-depth investigation and came up with some extremely disturbing facts and findings. There is nothing reputable, genuine, or legit about this binary options Auto-trader, besides the intent of the crafty thieves behind it to elegantly fleece your wallet and share the profits with shady offshore and unregulated brokers. Below you will see what is called the “widget” area in the members section of the Altronix app software. If you scroll below the registration form you will see this content widget moving up and down with so called “traders” telling you how fantastic the software is. If you compare the same members area in the Citidel App, you will see its exactly the same people telling the exact same lies verbatim. 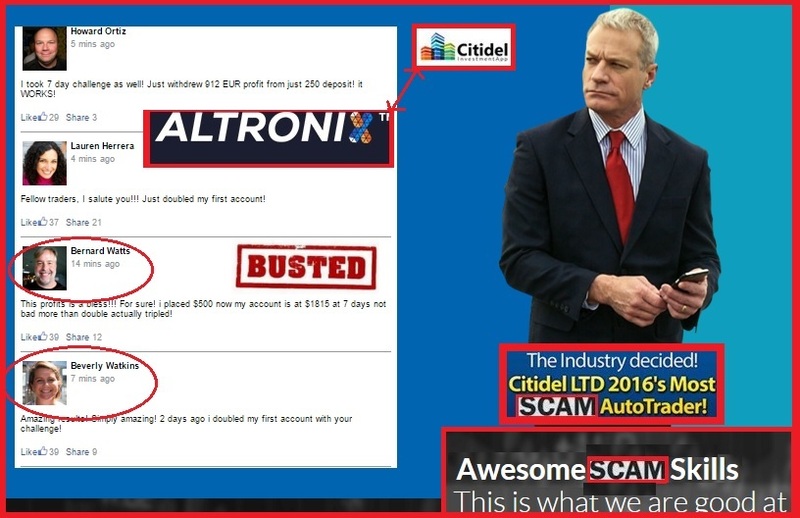 This means the Citidel LTD software is exactly the same as the Altronix App and the same scammers are behind it. If you are in denial and ever need MORE evidence, below you can see Mr Bernard Watts posing as an image bank actor at a site called C4d-models.com, only there he is named Vladimir Yegorov (if you believe that). Feel free to check him it out on Google if you want to. 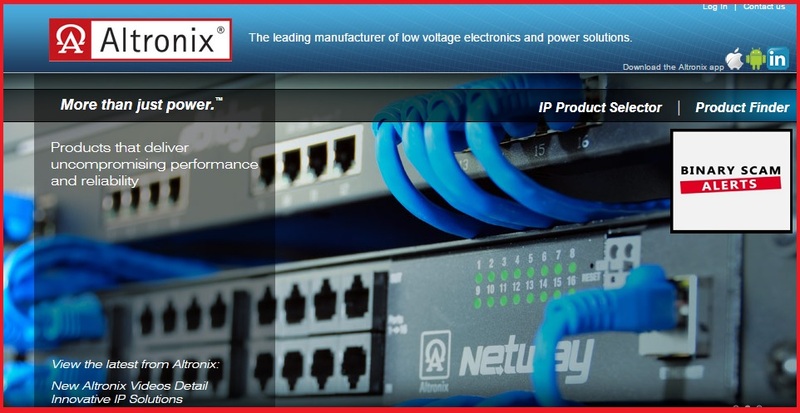 Altronix is a real and private company co-owned and managed by Jonathan Sohnis who is also the Chief Technology Officer. This company is totally legit and manufactures low voltage electronics and power solutions. It has nothing to do with this garbage code, and I’m sure their legal department will have a field day with this. You can read about the real Atronix at Bloomberg if you need additional information. This so called trading app is really a closed system programmed in PHP (Open Source) which is designed to intentionally take inferior positions, lose your money, and is anything but accurate. At best the algorithm is set to random where you stand a 50% chance of making ITM trades and will definitely deplete your account balance. So, in reality you will not need fancy charting tools and technical analysis in the form of Fibonacci Retracements or Oscillators that will indicate non-trending market movements. This will not help you one bit, and the only thing you need to concern yourself with is trying to recover from this sad predicament. These include the notorious Copy Buffet App, Centument, Trade Fusion, Push Money App, Insured Profits by Dave and Ginny, the Free Money System with Walter Green, Qbits Megaprofit System, Tauribot, binary app 810, and Zulander Hack. The software is supposed to take winning trades with high ITM ratios and help you profit from trading. However, it is plain to see the deception and the utter disrespect these cyber-pirates have for the regular working man (or woman). They could not care less about your pension, college tuition fees, or medical bills, and are only concerned with ripping people off and splitting the profits with the brokers. Well, you might have guessed it’s free but you would need to sign up and fund a trading account with one of their regulated brokers. Again, this is another very strong indication of a scam since the broker selection process is not transparent. Are There Any Real Alternatives Available? If you are searching for a solid signals tool you need to read our Binary Profit Method review. If you insist on an Auto-trader you will want to check out our Virtnext review. 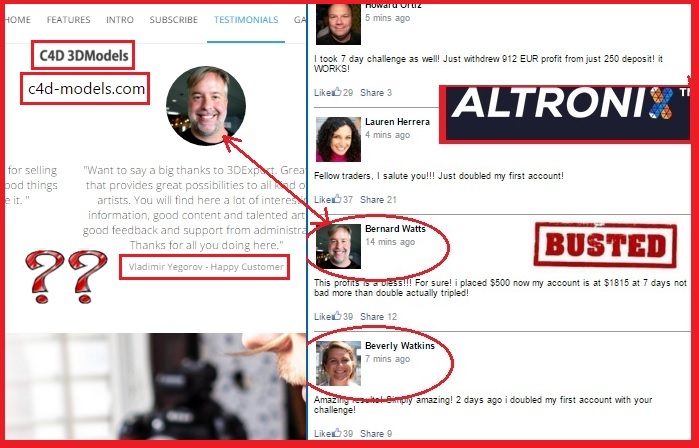 The Altronix App and software is a sophisticated scam designed to cheat, deceive, and trick you into registering with and funding a trading account with unregulated shady offshore binary options brokers. If you are hesitant about buying into this software, after reading this review you should understand its a fraudulent app and to stay away. If you have already invested money through this system, try to get out as fast as you can, and don’t forget to subscribe to our Facebook page and YouTube Channel.